Click here for more from the HISD Dream Summit. Excitement filled the air at HISD’s fourth annual Dream Summit, held Saturday at Hattie Mae White, drawing hundreds of students eager to collect resources and information about college applications and financial aid. The HISD Office of College and Career Readiness and Multilingual Programs event is held each year to aid HISD DREAMers, DACA (Deferred Action for Childhood Arrivals) recipients, visa holders, permanent residents, refugees, and asylum grantees, along with their families. This entry was posted in DACA, News, Special events, Wraparound services on December 17, 2018 by HISD Communications. College Readiness and Multilingual Programs will be hosting the fourth annual Dream Summit to assist students with college applications and the financial aid process on Saturday, Dec. 15, from 9 a.m. to 1 p.m. at the Hattie Mae White Educational Support Center, 4400 W. 18th St., Houston 77092. High school students and their families are encouraged to attend the free event. Students should contact their campus college-access coordinator, counselor, or college-success adviser regarding transportation. Five seniors will have a chance to win a $500 scholarship for college. 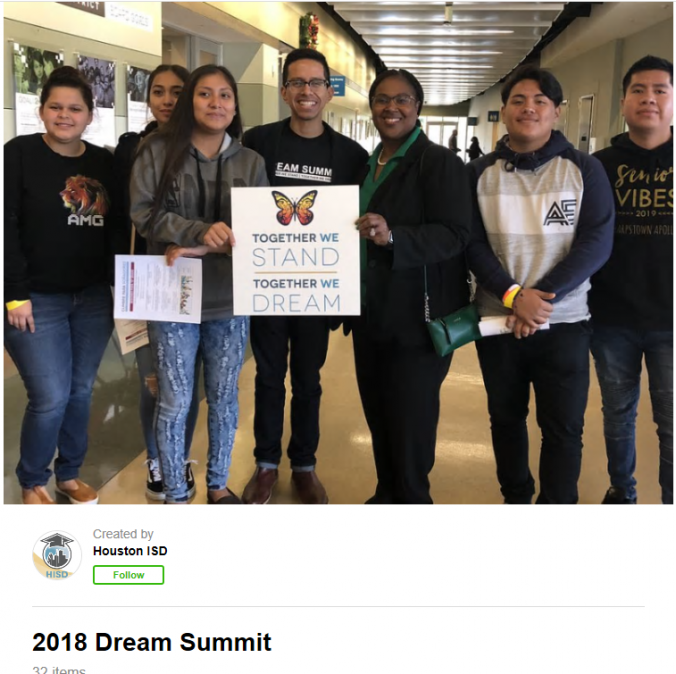 This entry was posted in DACA, News and tagged DREAM Summit on November 8, 2018 by HISD Communications. HISD’s third annual Dream Summit, held Saturday at Hattie Mae White, drew more than 200 students eager to collect resources and information about college applications and financial aid – about double the attendance over last year. The HISD Office of College and Career Readiness and Multilingual Programs event is held each year to offer assistance to HISD DREAMers, DACA (Deferred Action for Childhood Arrivals) recipients, visa holders, permanent residents, refugees, and asylum grantees, along with their families. Assistant Superintendent of Multilingual Programs Gracie Guerrero said the goal of the event is twofold. This entry was posted in College Readiness, DACA, HISD: Our Story, News and tagged DREAM Summit on December 11, 2017 by HISD Communications. Wisdom High School will host a free town hall meeting on Sunday, which will be moderated by City Council Member Amanda Edwards regarding the passage of Texas Senate Bill 4 (SB4) and the discontinuation of the Deferred Action for Childhood Arrivals (DACA) program. The “Be The Solution: Youth & Family Immigration Town Hall” will be held at the campus (6529 Beverly Hill, 77057) from noon to 3:30 p.m. and will include a lunch and resource fair, and a panel discussion with Charles C. Foster, Immigration Attorney & Chairman of Foster LLP; Houston Police Chief Art Acevedo; Norma Torres Mendoza, DREAMer; Jill Campbell, Immigration Attorney with BakerRipley; Juliet Stipeche, Director of Education for the City of Houston; and Joy Alessi, Co-Director of Adoptee Rights Campaign. The event will be translated in Spanish. This entry was posted in DACA, High Schools, News, Parents on November 29, 2017 by HISD Communications. Superintendent Richard Carranza participated in a live town hall meeting at UH Downtown on the Deferred Action for Childhood Arrivals (DACA) program, assuring those in attendance that HISD schools are a safe place for all students – regardless of their immigration status. The meeting, sponsored by ABC13 and Univision 45, was a non-partisan conversation on Monday night between students and five local panelists about the program and the impact of DACA’s suspension to the city and its residents. Carranza said there is an estimated 1,500 seniors in HISD who are DACA students, but there may be more since the data is not tracked. He added that the district is providing resources and counseling to those students, many of whom have college and career aspirations. Carranza also reassured students that the district is also busy advocating at the state and national level on the issue. DACA recipients whose status is set to expire in the next six months will lose their protection from deportation and their work permit this year under the plan to start phasing out the program – unless they reapply for a two-year renewal by Oct. 5. The Department of Homeland Security will no longer consider new applications for legal status and the U.S. Citizenship and Immigration Services (USCIS) said it was rejecting all new DACA requests and employment authorization document (EAD) applications received after the Sept. 5 memo. ABC13 and Univision 45 moderated the event, which also included United We Dream’s Oscar Hernandez, Baker Ripley managing attorney Jill Campbell, St. Frances Cabrini Center for Immigrant Legal Assistance program director Zenobia Lai, and Dawn McCarty from UHD’s social work department. Questions from UHD students were submitted anonymously and read by their peers. This entry was posted in DACA, News and tagged Dreamers, superintendent on September 26, 2017 by HISD Communications. The HISD Office of College and Career Readiness and Multilingual Programs departments will be hosting the third-annual Dream Summit to assist students with the college application and financial aid processes on Saturday, Dec. 9, from 9 a.m. to 1 p.m. at the Hattie Mae White Educational Support Center, 4400 W. 18th St., Houston 77092. High school students and their families are encouraged to attend the free event. Students should contact their campus college-access coordinator, counselor, or college-success adviser regarding transportation. Five seniors will have a chance to win $500 scholarships for college. This entry was posted in College Readiness, DACA, News, Wraparound services and tagged DACA, DREAM Summit on September 26, 2017 by HISD Communications. Catholic Charities of the Archdiocese of Galveston-Houston will host a series of free workshops for DACA (Deferred Action for Childhood Arrivals) recipients to assist them in completing renewal applications. This entry was posted in DACA, News, Parents and tagged DACA on September 15, 2017 by HISD Communications. This entry was posted in DACA, News and tagged DACA, Deferred Action for Childhood Arrivals, Superintendent Carranza on September 6, 2017 by HISD Communications.